Vending machines with drinks are available for guests of the Travel Inn Vicksburg. 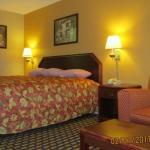 Free parking is also possible on site and the entire motel is air-conditioned for comfort during the warmer seasons. This property is 10 minutesâ?? drive from the Vicksburg National Military Park. Jackson Mississippi is 40 minutesâ?? drive away.